The territory which comprises Greenfield Township is in sections 7, 8, 17, 18, 19 and 20 of township 75, range 31. This subdivision was organized in 1859 and originally constituted the territory now known as Greenfield, Lee and Orient townships. Orient Township was first to withdraw from this territory, which occurred June 7, 1869. It was then organized as Dayton Township, but was afterwards changed, by request of the citizens, to its present name. Lee followed in the fall of 1880, leaving Greenfield as it now is. The first to make a settlement within Greenfield Township were two men named Hodgson and Hillin. They came in 1854 and located upon the southwest quarter of section 7. Here they constructed pole cabins of the most primitive architecture. However, they made no improvements and soon left the county, their lands falling into the possession of Milton Munger. The next to make a settlement was S. K. Mallery, who had made some improvements and broken some land when the Town of Greenfield was laid out. Among the other old settlers of this part of the county might be mentioned J. Myers, Matthew Clark and A. P. Littleton. A. P. Littleton opened the first store in the town, in the first building which was erected in Greenfield. This was a small structure, built of planks, and had been used as a stage station. In June, 1859, he put in a small stock of general merchandise in a front room. In the fall of the same year he removed to a small building which had been erected on a lot on the east side of the square. This building was some time afterwards removed to near the hotel and here Mr. Littleton ran his store until 1868, when he built a new building on the same lot and in this continued until 1878. In December of that year he sold his stock of goods to A. P. Stephens & Company, who ran it until March, 1883, when it passed into the hands of Fuller, Warren & Company. The fourth place of business was opened by Hutchinson Brothers in 1873, in a small building erected by C. P. Gilbert. They had a general stock of goods in which dry goods predominated. The second place of business in the town was that of C. P. Gilbert, who opened a drug and grocery store in the spring of 1869. This he continued until the autumn of 1873, when he sold out to Hutchinson Brothers. The first blacksmith was H. W. Blakeley, who erected a building directly opposite and west of where the Citizens' Bank later stood, in the year 1859. Franklin Letts was another early blacksmith. The pioneer wagon maker was Caleb Lyon, who had his shop in the same building with Blakeley, the blacksmith. In 1870 Charles Bishop established the first harness shop in the town. Written by Miss Pearl Oldham, a member of the Greenfield High School. The Town of Greenfield is situated about a mile and one-half south of the center of Adair County, Ia. It is the county seat of the county and has a population of 1,445. A stage coach station built of logs and with a canvas roof at first stood where the West Side Livery Barn lots now stand. It was run by Matthew Clark. The old barn stood where Haven & Heifner's livery barn now is. The present town was laid out in 1856 by Milton C. Munger. 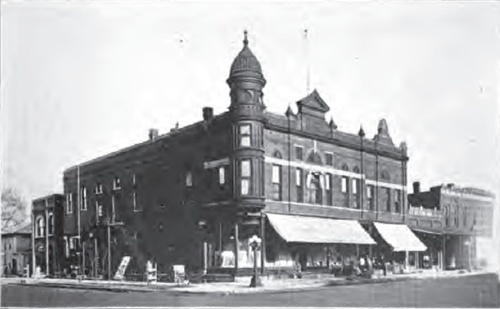 The first building built was the Kirkwood Hotel, into which Mr. Clark then moved his hotel. 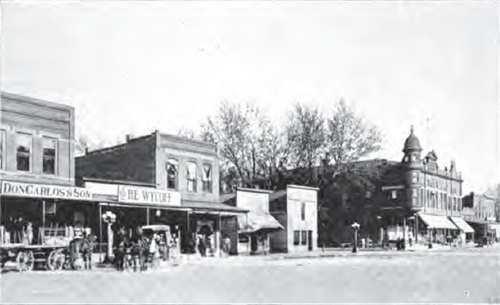 It stood where Whitnah's store now stands. Among the first dwelling houses were those of Mr. Myers, standing where Coffey & Irwin have their implement store; A. P. Littleton's, the present home of Vern Littleton, and a log cabin east of where Mr. Sullivan now lives. 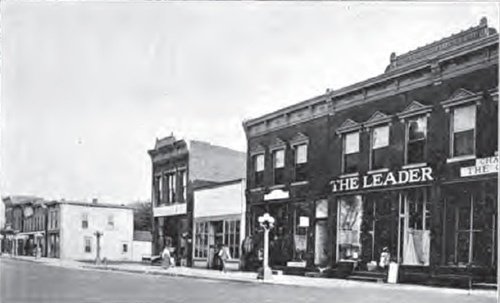 The first store was opened by A. P. Littleton in June 1859. It was in the same old log building in which Mr. Clark had had the stage coach station. He ran a general merchandise store, having groceries, dry goods, hardware, boots and shoes, and even keeping millinery. He also had the postoffice in the same building. C. P. Gilbert had the second store. It was a drug and grocery store, opened in 1869. Charles Bishop ran the third store opened. It was a harness shop opened in 1870. 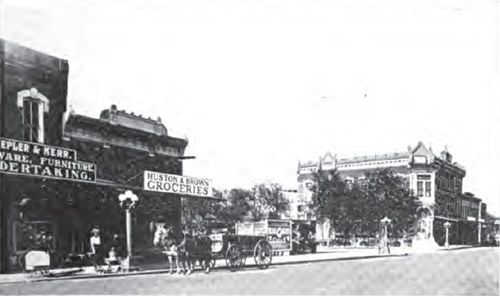 The fourth store was a general merchandise store opened in 1873 by the Hutchinson Brothers. After this the stores began to be opened quite extensively. It was about this time that the county seat war was going on. Fontanelle had been the county seat, but Greenfield wanted the honor and for several years had been working toward that end. Finally, March 22, 1875, the records were moved from Fontanelle to Greenfield. This was on Monday, and on the following Monday Judge Mitchell came to hold court and was invited to come to Greenfield, as the county seat had been changed. He informed the people that the county seat was still at Fontanelle and went over there and directed the sheriff to go and bring back the records. Several men went with the officer and they came over and tried to get them but could not do it. He could do no more the next day, and so on Tuesday evening a messenger was sent to Des Moines, who returned the following evening with Gen. N. B. Baker, the state adjutant-general. He finally persuaded the Greenfield people to let the records be taken back to Fontanelle. But on the 24th day of June, 1875, the county seat was again moved to Greenfield by a decision of the Supreme Court, and here it has remained ever since. Greenfield then donated a courthouse to the county and it stood where Mr. Warren's store now is. The following year, 1876, the town was incorporated. On June 2, 1875, the first newspaper here. It was the Greenfield Transcript, edited by Mr. Flynn. In 1879 the railroad came through the town. It only went to Fontanelle but was afterward extended to Cumberland. The first school taught was in an old log house standing east of where Mr. Burget's property now is. In the summer of 1861 the first schoolhouse was built. It was situated on the west side of the present South Ward school grounds. But finally there were so many pupils that they had to rent rooms from other buildings and hold school in them. The money was raised and in the summer of 1877 the South Ward school building was built at a cost of $5,230. Again in 1883 more school room was needed and the North Ward School was built. The first church erected was the Methodist Church in 1877; the next was the United Presbyterian in 1881; the third was the Baptist erected in 1883; and the fourth was the Presbyterian in 1884. In 1883 a fire broke out in J. W. Valentine's bakery, standing where it now stands, which burned north and took all the buildings along there, including the courthouse which the town had built. Immediately another courthouse was built, but this time by the county. It was not nearly so good as the one built by the town and often went by the name of "sheep shed." In 1891 the present courthouse was built and the "sheep shed" was moved over on the west side of the square where Green's store now is. It was afterward moved again and was divided and now is used for a feed store and poultry market. On December 19, 1890, the electric light plant started up, which was a great improvement to the town. Since then a new engine has been put in which is much larger and better than the first one. From that time to this many new buildings have been erected. The town is well supplied with cement walks, which is a striking feature to anyone coming into it. 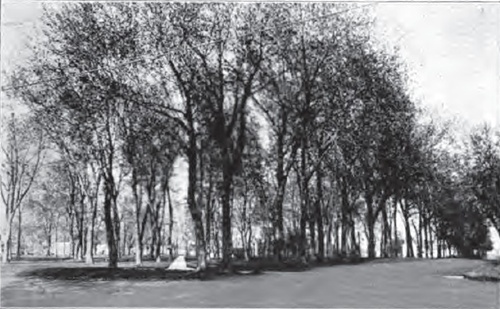 It also has a park donated to the town by Milton C. Munger, the same time that the city was laid out. In 1903 the new jail was built, which is a large brick building situated in the east part of town. It is a great improvement over the old one, which was a frame building from which criminals often escaped. From that time to this nothing of any great importance has happened to change the history of the town, and now the inhabitants live in peace and happiness. Greenfield is justly noted as a city of beautiful homes and an unequaled place of residence as well as where the occupants, more generally than in other towns of like size, are owners in fee of the homes which they occupy. Here are to be found the homes of rich and well-to-do and the cottages of those in the humbler, but no less honorable, walks of life. Around and about them all is the air of cheerfulness. A visitor to Greenfield will find a town which has had a steady growth without the usual boom. They will find a town whose property has been born by the safe conservatism of men of wise perceptions. Business has extended and values have arisen, but not more rapidly than the legitimate growth of the town and the development of the surrounding country would justify. Greenfield is a thriving little city of wide-awake, enterprising citizens. It is the receiving and distributing point for a rich agricultural and stock raising district. Greenfield is unlike most towns of its size. Thrift and energy are noticed on every hand. The business portion of the town never appears dull to the observer. Creditable buildings and business blocks occupy the main street, and a tour of the residence portions of the town will disclose many handsome homes and well kept lawns. Greenfield has an excellent city government, the different officers being chosen from among the most prominent citizens. Temperance is the watchword and no saloon is to be found in the city, nor is drunkenness often seen among the people. Life and property are valued and well established and maintained, and with good society, healthy and delightful climate, and mail facilities, good schools and churches and institutions, living in Greenfield is a decidedly pleasant occupation. The citizens Bank of Greenfield was organized on January 2, 1880, with C. D. Bevington as president; A. P. Littleton, cashier; and John J. Hetherington, assistant cashier. This bank was at that time run by a private banking company. In the year 1900 this bank became the First National Bank of Greenfield, the charter issued bearing the date of May 7, that year. The organizers of the National bank were: A. P. Littleton, Lewis Linebarger, H. N. Linebarger, V. C. Littleton, and John A. Storey. A. P. Littleton was the first president; Lewis Linebarger the first vice president; H. N. Linebarger, first cashier; And V. C. Littleton the first assistant cashier. The first and present capital stock is $25,000; the surplus is $10,000; and the deposits average about $255,000. The present officers and employes of the bank are as follows: Guy A. Lee, president; J. C. Hoyt, vice president; John A. Barr, cashier; E. G. Barrett, bookkeeper. The institution owns the bank building now occupied, which structure was erected in 1898 at a cost of $6,100. This bank has always been successful in its business transactions and has merited the full confidence of the people. The financial condition of this bank is open to the inspection of the public at all times and every official examination has proved the books and accounts to be satisfactory. The Adair County Bank, the first one in the county, was established by D. Heaton & Company on January 6, 1876, a building having been erected for the purpose the previous September. This bank is a private institution, but beyond this nothing can be said. For reasons best known to themselves, the officials of this bank refuse to give any information regarding the financial conditions and history of this institution for publication in this work. In 1858 a hotel was erected in Greenfield by Mathew Clark and, as this town was then an important station on the route to California and then and subsequently a convenient stage station on the lines of travel into Kansas, Nebraska and Missouri, this hotel was quite popular. Clark ran it until the spring of 1861, when he traded it to A. P. and A. D. Littleton. Clark moved to Colorado in 1863. The new owners of the hotel ran it a short time and then disposed of it to John Shreves, who kept it for several years. It then passed through several hands, among the owners being N. C. Eaton and E. R. Olmstead. The hotel had several names during its history. There was another hotel erected during the latter part of the year 1883, known as the Wilson House. In 1887 a grist mill was constructed, operated by a windmill. This stood opposite the residence of A. P. Littleton. The mill was a complete failure and the $1,000 which had been subscribed by the people was lost. It was afterwards sold at sheriff's sale and purchased by A. P. Littleton. He tore the structure down. J. R. Kearney commenced the erection of a steam grist mill on April 1, 1884. It was 36 by 40 feet in ground area, three stories high, had three run of buhrs, with a capacity of producing fifty barrels of flour and grinding some three hundred bushels of corn. The cost of this mill was about eight thousand dollars. The Greenfield steam elevator was built in the spring of 1879 at a cost of $4,000. The builders and owners were the Scholes Brothers. The Little Jay Creamery was an early industry, established as a dairy in September, 1883, at which time the building was completed. The dairy business was carried on until May, 1884, when it merged into a creamery. The first house erected in Greenfield was built by Mathew Clark, for a stage station, in the year 1856. It was built of plank. The first religious services were held at the house of S. K. Mallory, in the winter of 1858, by Rev. J. M. Rush of Lewis, who was a clergyman of the Methodist Episcopal denomination. In accordance with a petition signed by fifty of the leading citizens of Greenfield and dated April 27, 1876, an election was ordered to be held on the question of incorporating the town of Greenfield according to the laws of Iowa. The notice for this election was signed by S. C. Vance, E. Spooner, W. M. Rodgers, Richard Wallace and T. M. Neville, commissioners, and the date for the election was set for May 22, 1876. On this day S. C. Vance, W. M. Rodgers and R. Wallace acted as judges and Thomas W. Neville and J. McDermid as clerks of the election. When the ballots were counted it was found that there had been 101 votes cast in favor of incorporation and only 5 against it. It was then declared that the following territory was duly incorporated under the title of the Town of Greenfield: the south half of section 7, together with the north ten acres of the northeast quarter of the northwest quarter of section 18, all in township 75, range 31. The first officers of the town were the following: A. P. Littleton, mayor; L. E. Wilson, clerk; S. C. Vance, Charles Burrell, J. A. Myers, T. J. Shinn and D. Patterson, council members. The general knowledge as to the date of the establishment of the postoffice in Greenfield places it as 1856 or very near that year. M. Clark was the first postmaster and kept his office in his old plank house used as a stage station. He later removed it to the hotel later known as the Kirkwood. He was succeeded in this office by W. G. Boggs, who again removed the office to the house on the later site of the Wilson House. A. P. Littleton was the next postmaster, and he kept it in his store. He was succeeded by James Waggener, who moved it to the hotel, but in a short time it passed back into the hands of Littleton and he again took it to his store. Z. L. Eaton, James Waggener and A. S. Carmichael in turn occupied the position until 1881, when Dr. E. Spooner was appointed. The office was made a money order office on July 1, 1877, and the first order drawn was issued to Mary Winterburn of Greenfield for $1.75 and in favor of J. W. Walker of St. Louis, Mo. Some of the men who have served as postmaster since Spooner are: J. S. Sidey, John J. Hetherington, H. P. Gow, R. B. Oldham, Frank B. Wilson. The office in 1915 is in the third class. There is no city delivery, but four carriers have rural routes. There are two employees in the office besides the postmaster. The Greenfield Commercial Club was organized in July, 1905, with the following first officers: E. J. Sidney, president; O. R. Yeager, W. L. Battin, J. N. Haddock, vice presidents; G. D. Musmaker, secretary; S. Y. Cornell, treasurer; S. D. Woods, corresponding secretary. Others who took an active part in the formation of the club were: J. T. Taylor, J. A. Burrel, W. W. Don Carlos, J. E. Brooks, Theodore Coffey and E. M. Syp. The purpose of the organization was to improve the city in every possible way. After the county seat controversy there was felt the need of a paper in Greenfield which the people could trust and patronize with satisfaction to themselves. The reporter had taken such a course in the matter of the county seat that it was not popular. Under these circumstances Charles Stuart, who had considerable interest in the county, resolved to establish a paper at this place. He accordingly procured a press and type and an office outfit and shipped them across the country from Stuart. J. J. Flynn, then editor of the Stuart Locomotive, came down to superintend the matter. The press was established in the upper room of the A. P. Littleton Building. The type was hastily set up and on July 2, 1875, the first number of the Greenfield Transcript was issued. It was an 8-column folio, one side of which was printed in Chicago. Mr. Flynn was the nominal editor at this time, but owing to the time taken by his interests in Stuart, the active work as editor was largely performed by Joseph McDermid, a young lawyer of Greenfield. Mr. Flynn continued as editor until November 24, 1876, and then McDermid assumed control as editor. He continued until April 20, 1877, at which time John W. Jones took his place. Mr. Jones continued in editorial charge of the paper until it was purchased of Stuart on March 1, 1878, by Dr. E. Spooner. In November, 1882, he disposed of a third of his interest to A. J. Shrader. Spooner afterwards sold out to C. D. Hunt and then the firm name became Hunt & Shrader. About the year 1901 H. P. Gow bought Hunt's stock and entered into partnership with Shrader, eventually taking over the entire plant. In 1906 he sold to the firm of Lynch & Oldham, which latter firm continued business together until 1913, when H. G. Lynch purchased the entire paper and continues successfully at the present time. The paper is now a 6-column quarto and maintains a very high journalistic standard. It is a decided aid to the formation of opinions in the county, besides being up to the minute from a news value standpoint. The old Reporter was merged into the Transcript in the year 1889. The Free Press, at present the largest newspaper in Adair County, was established in the year 1889 by Mr. E. J. Sidney, who has remained the owner and publisher of the paper for the entire twenty-five years, winning a well-merited success in the journalistic field and steadily increasing the circulation until now the paper has over two thousand subscribers. The paper was for eighteen years called the Adair County Democrat and then was changed to the present full name of The Adair County Free Press. The first make-up was in the style of a 6-column quarto and this has been retained without change. In the year 1903 the increased patronage of the paper and the installation of modern newspaper machinery made imperative the construction of a special building for the accommodation of the plant. In this above named year, therefore, a brick building was built, costing the sum of $6,000, being solid in construction and well adapted to its use. The machinery used in the production of the Free Press is of the latest type and designed for efficiency plus speed. The paper has been democratic throughout its life, being defined now as an independent democratic sheet. Six employes are retained by the management of the paper, to care for the extensive job work as well as the regular publication. Considering the difficult task the paper faced in gaining a foothold in the county, the growth and increased popularity of the Free Press should be a fact worthy of favorable comment and a record of pride for Adair County journalism. In the summer of 1906 a petition was circulated requesting the city council to call a special election to vote on the proposition of issuing waterworks bonds in the sum of $25,000. The city council visited other towns for the purpose of inspecting the various waterworks systems and to ascertain the best in use. After the preliminary arrangements had been made the mayor of Greenfield ordered a special election to be held September 10, 1906. This was accordingly held and resulted in a vote in favor of the proposition and the issuance of bonds to the amount of $10,000, but owing to some technicality in the preparation of the papers for the election the bonding companies would not buy the bonds. At the first election 360 votes were cast; 279 for and 81 against; 100 women voted for the works and 4 against. At the second election held May10, 1909, 304 votes were cast, 253 of them being in favor of the proposition, and 235 votes were cast in favor of issuing the bonds. The contract for the erection of the works was let to T. C. Brooks & Sons Company of Jackson, Mich., in August, 1909. Wells were dug in the southeast part of town, giving a good supply of water, and main pipes laid in the principal streets, so that the town is well supplied with water for house use and fire protection. In 1911 the town council of Greenfield let the contract for paving the city square and adjacent streets to Beebe Brothers of Omaha, Neb. About eight blocks were paved and the aggregate cost was about twenty-three thousand dollars. The decision to pave the public square in Greenfield was a welcome one to the citizens of Greenfield and the county, as well as to the many travelers and visitors to the city, for of all the unsightly places in the county the muddy, rock-ribbed street around the courthouse was the worst. The paving is of concrete and adds much to the appearance of the town. In the summer of 1912 the town council decided upon an additional paving of about one mile, of concrete. The contract was made with D. W. Wright & Company, of Bedford. This contract was taken at ten cents less per square yard than that of 1911. The City of Greenfield has altogether a little over two miles of concrete pavement. The electric light plant of Greenfield first started operations in 1890. The following is the first report of the income and expense of the plant from 1890 to January 1, 1892: Total cost of coal, $681.60; freight on same, $362.79; hauling from depot, $103.33; engineer's salary, $621.35; oil and waste, $72.34; supplies, $27.60; hauling and pumping water, $22.22; insurance, $30; total, $1,921.33. Lamp rentals collected, $2,598.09; lamp rentals uncollected, $74.25; total, $2,672.34. The balance was $751.01 on the income side of the ledger. The report was signed by A. Rivenburgh, the engineer in charge. The electric light plant of Greenfield has gradually extended its service, until now it is a very prosperous institution, supplying light to Fontanelle as well as to Greenfield. In October, 1912, the question of changing the current from direct to alternate came before the people. The town believed that the plant should be re-equipped to make provision for future demands and to provide better service. An election was called to decide whether or not to authorize the city council to issue $9,000 in bonds in order to make the necessary changes. At the election 431 votes were cast, resulting in a majority of 256 for the improvement and the issue of the bonds. There were 159 men voting at this election and 161 women. In November, 1910, the City of Greenfield, by the medium of the council, decided to erect ornamental electroliers around the public square.. The McDonald Iron Works of Des Moines supplied the posts, each supporting five lights. There are sixteen posts around the square with a total of eighty lights. It is the intention to continue these lights into the residence districts at some future date. The first talk of establishing a free public library in Greenfield occurred in July, 1896, but the plan never materialized. Although there has ever been a need of a good library in the town, particularly for its educational advantages, a certain proportion of the population have been opposed to it. The reason for this antagonism is vague, for it cannot be conceived how a progressive people, interested in the welfare of their children and at all careful of their own enlightenment in the way of world knowledge and progress of current events, should be blind to the advantages of a public library. However, the question was again agitated in the spring of 1915 and the proposition submitted to the vote of the people. The election was held in the fore part of April of that year and resulted in carrying the issue by a majority of seventy-five. It is interesting to note that the vote polled by the women was responsible for the needed improvement. The women voted 180 to 68 for the library, while the men voted 158 to 124 against the same. It was indeed fortunate for the Town of Greenfield that the women had the privilege of the ballot-box at this time. Steps are under way to organize the library under the regulations of the statutes and funds will be obtained from Andrew Carnegie, the steel king, who has financially backed thousands of libraries in the United States. Crusade Lodge No. 386, Ancient Free and Accepted Masons, located at Greenfield, was organized July 5, 1878, with the following charter members: J. G. Culver, John J. Hetherington, J. T. Harvey, J. E. Howe, D. W. Marquart, J. A. Hetherington, S. M. Shattuck, W. H. Romesha, C. B. Hunt, R. O. Brown, W. M. Rodgers, A. J. Mears, R. Wallace, E. R. Olmstead, W. B. Burget and Joseph Raffensperger. The following were the first officers elected: J. J. Hetherington, worshipful master; J. E. Howe, senior warden; D. W. Marquart, junior warden. The first regular convocation was held on the evening of July 20th and the following appointments made to fill the other offices: C. B. Hunt, treasurer; J. G. Culver, secretary; J. A. Hetherington, senior deacon; W. H. Romesha, junior deacon; A. J. Mears, tyler; W. B. Burget, S. S., J. T. Harvey, J. S.
Greenfield Council No. 2, O. U. A. M., was organized under the jurisdiction of the national council on August 31, 1882, with about eighteen members. The charter bears the date of August 18, 1882, and is signed by G. H. Burton, N. C. And James N. Caldy and has the names of the following charter members: W. L. Scott, H. G. Spooner, A. J. Shrader, W. H. Romesha, Adam Beck, D. A. Coy, W. C. Carroll, D. A. Hites, C. E. Taylor, J. C. Purvis, J. C. Walker, James Murray, H. D. Woodman, George F. Arnold, J. W. McCormick, G. E. Inlow, C. N. Wilson, D. D. Pettit, B. E. Keen, A. T. Gregg, R. D. Critchfield, G., T. Porter, F. Hostetler, M. B. Packer and W. E. Hetherington. Greenfield Lodge No. 375, Independent Order of Odd Fellows, was instituted on January 30, 1878, by A. L. Tullus, most owrtthy grand master, with the following charter members: James Patterson, P. Hillyard, A. F. Porter, J. A. Burrell, C. S. Burrell. The first officers were: P. Hillyard, noble grand; C. S. Burrell, vice grand; J. J. Hetherington, secretary; A. F. Porter, treasurer. The Masonic and Odd Fellows Building Association was incorporated on February 20, 1883, by the two orders. The following were the first officers: J. J. Hetherington, president; A. E. Teague, vice president; J. E. Hill, secretary and treasurer; F. M. Brown, J. H. F. Balderson, D. W. Marquart, J. J. Hetherington, J. N. Haddock, P. Hillyard, W. C. Libby, A. E. Teague and J. E. Howe, directors. Homer Gaines erected the first story of a brick building, and the association built the second story, with the object of having a lodge room of their own. A stage was fitted up and it was then known as the Greenfield Opera House. Garfield Encampment No. 110, of the same order, was organized November 10, 1882. The charter members were: W. C. Libby, A. E. Teague, F. M. Brown, J. H. F. Balderson and S. Condon. Myers' Post No. 39, Grand Army of the Republic, was organized on April 28, 1881, with the following members: W. H. Romesha, M. W. Haver, J. C. Mason, J. C. Purvis, L. C. Elliott, Charles E. Taylor, Myron Bunce, W. P. Robinson, C. B. Hunt, H. A. Gilbert, T. A. Wilson, L. J. Gray, G. C. Havens, S. G. Long, T. M. Ewing, R. M. Quinn, C. D. Knapp, M. S. Doane, C. E. Morris, F. Letz, W. H. Anderson, A. L. Harrison, M. E. Black, J. T. Harvey, M. N. Boardman and J. A. Easton. The first post commander was W. H. Romesha. Legion of Honor was organized in Greenfield on January 24, 1881, with the following charter members: F. H. Wilson, A. R. Dew, J. G. Goodman, Charles Arnold, M. W. Haver, J. A. McElhaney, F. P. Culverson, J. E. Hill, W. H. Anderson, W. H. Harrison, John Derby, Charles Taylor, J. A. Easton, J. C. Trenor, John H. Stoey, J. B. Heacock, J. B. Mather, J. E. Mather, N. T. Gadd, J. A. Hetherington. Company B, Third Regiment, Iowa National Guard, was organized in 1879 through the exertions of C. B. Hunt, the state senator from this district. The first officers were as follows: C. B. Hunt, captain; Thomas H. Ruth, first lieutenant; P. Hillyard, lieutenant; and W. H. Romesha, orderly sergeant. The G. A. R. Circle was organized in Greenfield in January, 1914. It is composed of women relatives and wives of Civil war veterans. The first offices were held by the following: Mesdames C. A. Gibbs, R. M. Quinn, Robert Wilson, W. C. Smith, John Luers, Marion Young, B. H. Kenworthy, Lester Smith, and Misses Edna Gibbs, Mary Woods and Louise Gibbs. Martha Rebekah Lodge No. 37 was organized on March 5, 1890, with twenty-one men and twenty-two women. Dr. T. W. Mulhern was the first noble grand and Mrs. George Condon the first vice grand; Mrs. O. A. Tuttle was the first secretary. The order at present is the largest in the City of Greenfield, having 150 members. This lodge has also instituted lodges at Orient and Bridgewater. Several members of the order have held state offices in the same. Myers Woman's Relief Corps was organized March 3, 1888, with about twenty members. Ella C. Knapp was the first president and served six years. The corps now has a membership of eighty-four. The first creamery for co-operative butter manufacture was established by Henry Wallace and Ross on land in Orient Township owned by the former, which creamery was managed by the latter. Mr. Wallace is now the veteran editor of Wallace's Farmer of Des Moines and was a member of the commission appointed by President Roosevelt to inquire into the conditions of the country life. He owned at the time of the creamery building in 1881 several farms in Adair County and published a farm paper at Winterset. The creamery was not a success and was discontinued in two or three years. George Hoisington built the second creamery at Fontanelle in 1882. He was an expert butter maker from Wisconsin, but the conditions under which the business was conducted at that time were unfavorable and after some years of strenuous endeavor the plant failed. The Stewart brothers and Shannon undertook to re-establish the business and built fine brick buildings at Fontanelle and Bridgewater, with several stations in the country. They did a big business for several years, but finally went to the wall as a result of fierce competition developed by the increased business. On May 14, 1900, the Greenfield Creamery Company was started, with James F. Laude as manager. At this time there were several other creameries in the county and at nearby points, but owing to the large growth of the Greenfield plant all of these have ceased business. The business for the first year amounted to $60,000 and in 1914 totaled the sum of $112,000. Four years ago the egg business was added. The creamery is supplied with cream by the farmers of the county. With the exception of small shipments to the towns of Adair County all the products of this creamery are freighted to New York, to the George M. Rittenhouse Company, commission merchants. Four men are employed in the plant, including the efficient manager, Mr. Laude. The brick building was constructed in the year 1900.